Easy to pull, attach with handle. It can be moved in narrow space and rotate heavy load. 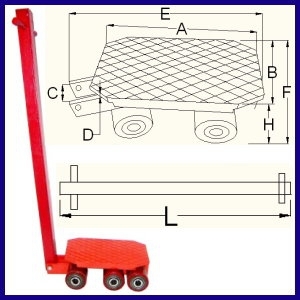 The special bearing construction can make the frontal wheels of Cargo Trolley move 45 degree. Several cargo trolleys can be used at the same time if the heavy load can be supported at several points and be distributed the force evenly. It is flexible, even for very heavy load.